HOW TO USE: Take this medication by mouth with or without food, usually every 8 hours or as directed by your doctor. Dosage is based on your medical condition and response to treatment. Use this medication regularly to get the most benefit from it. To help you remember, take it at the same times each day. Avoid eating grapefruit or drinking grapefruit juice while using this medication unless your doctor or pharmacist says you may do so safely. Grapefruit can increase the chance of side effects with this medicine. Ask your doctor or pharmacist for more details. Tell your doctor if your condition does not improve or if it worsens. DRUG INTERACTIONS: Your doctor or pharmacist may already be aware of any possible drug interactions and may be monitoring you for them. Do not start, stop, or change the dosage of any medicine before checking with your doctor or pharmacist first. Many drugs besides propafenone may affect the heart rhythm (QT prolongation), including amiodarone, dofetilide, flecainide, pimozide, procainamide, quinidine, sotalol, macrolide antibiotics (such as clarithromycin, erythromycin), and certain quinolone antibiotics (such as sparfloxacin), among others. (See also Precautions section.) 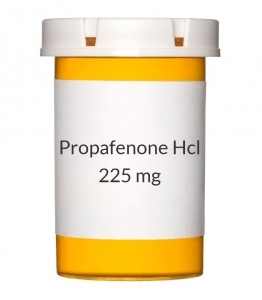 Other medications can affect the removal of propafenone from your body, which may affect how propafenone works. Examples include desipramine, ketoconazole, orlistat, phenobarbital, phenytoin, rifampin, and certain HIV protease inhibitors (such as ritonavir, tipranavir), among others. Propafenone can slow down the removal of other medications from your body, which may affect how they work. Examples of affected drugs include cyclosporine, digoxin, imipramine, metoprolol, propranolol, theophylline, venlafaxine, warfarin, among others. This document does not contain all possible interactions. Therefore, before using this product, tell your doctor or pharmacist of all the products you use. Keep a list of all your medications with you, and share the list with your doctor and pharmacist.